More from Tokujin Yoshioka: this time the Swarovski flagship store in Ginza, Tokyo. Named Crystal Forest, the exterior is covered in stainless-steel pieces reflecting fragmented views of the street. The store will open on 29 March 2008. 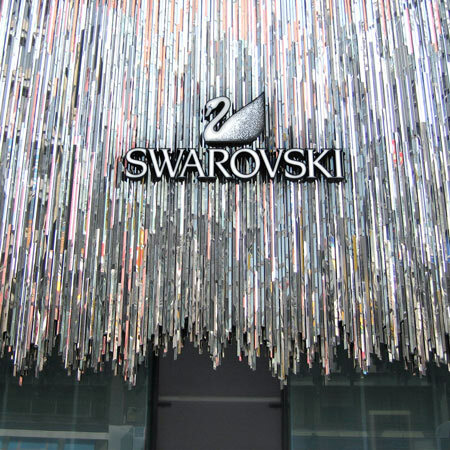 As the key elements of the shop, the facade is covered with stainless-steel mirror reliefs. It reflects the various scenes from the different angles and sparkles brightly like a “Crystal Forest”. Inside the store, the walls are decorated with the white reliefs all over, and the whole space gets the reflections of crystals and glitters brilliantly. Dazzling crystals on the floors that are buried in the stone like a fossil, the chandelier sending out the light flow just like a waterfall on a sunny day, and the crystal stairs that is winding up getting the light reflections make an illusionary space fantastically. On the second floor, there will be an opening installation called “Shooting Star”, in which crystals make a scene just like a fall of shooting stars. It will be presented only within a certain period of time.